webML The root package of the WebML language. 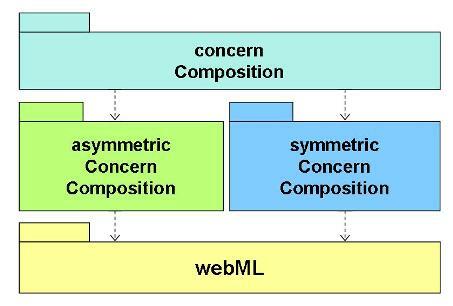 concernComposition The concernComposition package abstracts over different composition mechanisms, i.e., asymmetric and symmetric ones. asymmetricConcernComposition The asymmetricConcernComposition package provides concepts for asymmetrically composing concerns. symmetricConcernComposition The symmetricConcernComposition package provides concepts for symmetrically composing concerns.